People just can’t seem to live without internet access nowadays, whether it’s for business or pleasure and wherever they may be at the time. Some might even argue that an internet connection within a commercial establishment is already a necessity and no longer just a “nice to have” amenity. It doesn’t matter if your business has a public Wi-Fi for its customers; if the connection is too slow or patchy, then it’s as good as useless. Furthermore, it would also be a source of frustration for people. And as such, it may end up doing more harm than good to the reputation of your establishment. The service package is critical in establishing a public internet access in your business. Opt for enterprise-class Wi-Fi equipment for consistent high speeds, especially if you expect a sizable usage from your customers. Most service providers can also tailor-fit an internet package for your business, which will help you get the most out of your internet connection. The right equipment also matters. Consumer-model modems and wireless routers (those meant for home use) may work just fine for small businesses that don’t get huge volumes data traffic from customers. However, for larger businesses like big restaurants and hotels with consistently high foot traffic, you should definitely choose a premium modem and wireless router that can handle many users at the same time. Make sure to use solutions that can accommodate guest access configurations and have the ability to filter content and establish captive portals (more on that later) to manage bandwidths. Ideally, you should have two or three separate local networks: one for your staff, one for your operational needs, and one for your guests. This ensures that you can go about your business—say, monitoring stocks or paying your suppliers through online banking—without any problems, even as your customers enjoy fast browsing and streaming speeds. Setting up a guest network is also more secure for both you and your customers. Keeping confidential business information in a separate network will help prevent data theft and other security breaches. 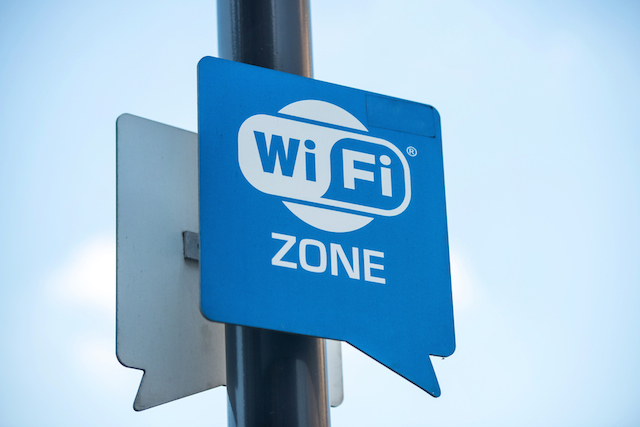 Setting up a captive portal—also a hotspot gateway in tech jargon—gives your guests a much safer way to connect to your Wi-Fi. With such a gateway in place, your customers will be able to select your Wi-Fi network on their device, and they will be directed to a login page. Here, they will be asked to pay a fee or enter a password before they are able to use the internet. The conditions are all up to you. A captive portal also allows you to set up special settings like content filters for each local network. For example, since downloads take a huge chunk out of the bandwidth, you can block access to torrent websites in the guest network. You can also give your business some level of legal protection by having your customers agree to a few terms and conditions before they can connect to your Wi-Fi. While it’s called public Wi-Fi, it doesn’t mean that you should allow everyone and anyone to access it. Not only is this prone to all sorts of abuse, it can also lead to cybersecurity issues. At the very least, you should encrypt your connection with WPA2 level security. All modern routers have this feature included by default. Issuing passwords by printing them on your receipts is also a good way to ensure that only your customers have access. Additional security measures include extra firewalls, disabling the WPS feature (which allows devices to connect with just one click), and frequently changing passwords. Captive portals also have built-in safety features, so follow the manufacturer’s advice to further beef up your network security. Another simple tip is to customize your Wi-Fi network’s name. “Default” or a bunch of random numbers just aren’t as professional-looking as a customized SSID, which helps establish brand identity. Moreover, a proper SSID will also emphasize to your customers that you take their internet connection and security seriously. These tips may seem a little cumbersome at first, especially the technical parts. However, following these tips in setting up a public Wi-Fi will ensure a smoother, safer experience, which is your ultimate goal when it comes to customer service.